The New York Giants have officially announced the re-signing of unrestricted free agents wide receiver Bennie Fowler, cornerback Tony Lippett, and long-snapper Zak DeOssie. It had earlier been reported that Lippett and DeOssie had already agreed to terms. Lippett signed a 1-year, $810,000 contract. 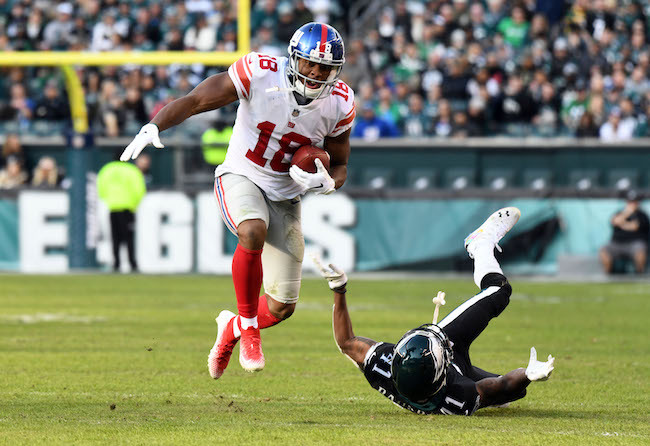 After signing late with the Giants in October 2018, Fowler surprisingly played in 10 games with five starts, finishing the year with 16 catches for 199 yards and one touchdown. The 6’1”, 212-pound Fowler originally signed as an undrafted rookie free agent with the Denver Broncos after the 2014 NFL Draft. He has spent time with the Broncos (2014-2017), Chicago Bears (2018), and New England Patriots (2018). Fowler has played in 55 regular-season games with 10 starts. He has 72 career catches for 897 yards and six touchdowns. The Giants signed Lippett in to the 53-man roster in October 2018. He ended up playing in three games, with no starts, and was exposed in coverage. A former wide receiver, the 6’3”, 192-pound Lippett was originally drafted in the 5th round of the 2015 NFL Draft by the Miami Dolphins. In three years with the Dolphins, from 2015 to 2017, Lippett played in 25 regular-season games with 13 starts. He missed all of the 2017 season with with a torn Achilles’ tendon. The Dolphins cut Lippett before the 2018 season started. DeOssie is one of the NFL’s most consistent long snappers, being voted to the Pro Bowl in 2008 and 2010. DeOssie was drafted as a linebacker by the Giants in the 4th round of the 2007 NFL Draft. He is now strictly a special teams player. In his 12 NFL seasons, DeOssie has only missed four games (all in 2015 with a wrist injury). Aside from his long snapping duties, DeOssie also excels in punt coverage. New York Giants unrestricted free agent free safety Curtis Riley visited the Green Bay Packers on Monday. The Giants signed Riley as an unrestricted free agent from the Tennessee Titans in March 2018. Riley surprisingly started all 16 games at free safety, finishing with 75 tackles, 5 pass defenses, and 4 interceptions (including one returned for a touchdown). However, he was often a liability against both the run and the pass. The 6’0”, 190-pound Riley was originally signed as an undrafted rookie free agent by the Titans as a cornerback after the 2015 NFL Draft. Riley spent his rookie season on Injured Reserve with an ankle injury. He played in four games in 2016 and seven games in 2017 with no starts.